It is amazing what Flipboard magazines can do for your business. This untapped resource has undiscovered potential. Hence the launching of #FlipBizChat to share ideas and concepts for future users looking for new branding and marketing solutions. In my last Twitter Chat session with Tawanna Browne Smith we discussed creating content for a Flipboard Magazine. As marketers, we are forever looking for new ways to promote our content. 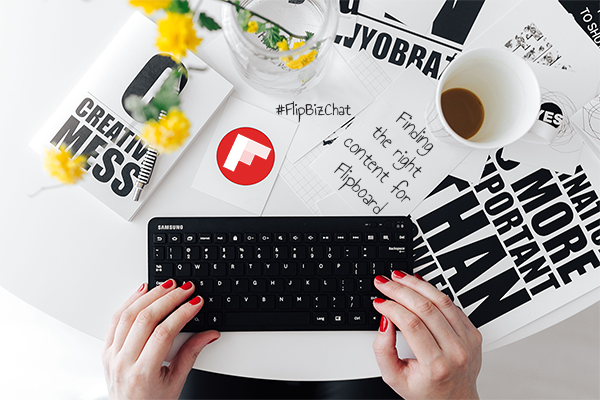 Q1: How do you find content for Flipboard magazines? Tawanna B. Smith: I find my content from Apple, Google, Emails, Tweets, my blog… wherever I see interesting content come across my path. Flipboard: Use Flipboard’s Search (magnifying glass) to find what you are looking for. Results are sorted by topic, mag & profile. You can flip from the Web using our tools. Martin Pronk: Combination of TwitterLists and Flipboard is perfect for finding relevant content and curation. So useful but hardly used. Q2: What kind of content do you like to read or see on Flipboard? Tawanna B. Smith: I like seeing a variety but especially images, videos and articles. I tried to use a variety of media in my In Love with London mag: vid, music, pics, text. Flipboard: From business to animation to travel, we have over 34,000 topics & thousands of magazines to browse. Alberto Gómez: My main interests on Flipboard are: + Content Marketing + Social Media + Financial Literacy + Cryptocurrencies. Yusra Salim: Search via Flipboard my topics that I am interested in with, easy to manage and I love sharing. Terry Porter: I love Photography on Flipboard, the visuals of the magazine layout and beautiful photos go well together! Q3: What platforms do you use to showcase your content? Flipboard: Flipboard can connect to Twitter, Tumblr, LinkedIn, 500PX, & Flickr. Tawanna B. Smith: I use my own site, Facebook, Twitter, YouTube, Pinterest, Instagram & Flipboard. Carla Jenkins: Twitter, Linkedin, Facebook, YouTube and Pinterest. Jessica Rosenberg: I show off my favorite Flipboard mags on my blog’s sidebar! Bia Valle: I use all platforms to work on my personal branding, and showcase my lifestyle and activities. Use Flipboard 4 curations. Q4: What are some of your passions? Jessica Jordan: I am passionate about travel, food, politics and gender equality issues and use Flipboard to read up on those topics every day. Melissa Reyes: I flip for Art, Livestream, Travel and driving my Jeep along the Coast with the top down soaking the SoCal Sunshine! Sabrina Cadini: I love color used in different applications: design, fashion, art and even nail art! Alberto Gómez: Professional Passions: Writing content, education — Personal Passions: Music, movies, history. Q5: What are your favorite tools for creating content? Kristina Sorrelli: Feedly, google alerts, constantly finding and reading new content all over the web. Flipboard: If you create content on mobile, you can save it to your camera roll & upload it to Flipboard with Compose. Janette Speyer: My blog, Medium, all Adobe software, Hemingwaysapp, Flipboard. Jessica Rosenberg: Favorite tool? My 10 fingers and my keyboard! HA! Karla: I love creating content on Flipboard — so easy and fast! Q6: How do you keep your content fresh and up to date? Flipboard: Stick to a regular curating routine, 5 minutes in the mornings is great. Clean up dead or outdated links, too. Kerwin McKenzie: I travel! And I’m inquisitive. I also survey my readers and endeavor to give them what they need. Terry Porter: Always be Flippin! Check for dead links too. Re-arrange content. Gaby Haviaras: Weekly work of thinking about content and produce, along with curating articles on the flip for ideas. Q7: What are your biggest challenges when finding content to curate? Coder J: Weeding out the good and bad articles can be time consuming. Specially with so much fake news floating around. Jessica Jordan: Finding trustworthy sources is always a challenge but I use Flipboard Smart Mags to follow the publishers I trust. Janette Speyer: Finding fresh approaches to old topics, keeping content interesting, finding covers for mags that tell a story in one image. Karla: Finding unique topics that stand out from the rest. Bia Valle: When curating, finding trustworthy sources is a challenge. One of the reasons, I (heart) Flipboard are the publishers featured. Q8: What’s your biggest challenge when creating content? Alberto Gómez: Distractions and creativity mood. I work better early in the morning and Saturdays. Bia Valle: A challenge for content generators and curators is to stay relevant; entertain but also to fill a need of their audience. Sabrina Cadini: I wish I had more time to write. Between event planning and business coaching I don’t have many hours left during the day. Q9: What are some of your favorite topics of Flipboard’s 33,000 topics? Tawanna B. Smith:‏ Black History, Tech, Marketing, Travel, Chocolate, Leukemia, Autism, London, Video. Here is my Travel through Brown Lensesmag. Kerwin McKenzie: Aviation, Travel, Tech are my faves. Will also look for some cooking Jamaican food stuff for my other blog. Christina Williams‏: Food and wine. Terry Porter: Photography, Marketing, Nautical, Texas, National Parks, Personal Finance, Sunflowers, Wine and many more #topics I love! Janette Speyer: I love all the tech, AI, Robotics, news, eggs, random, #Magswelove, #Flipblogger, #Flipmarketer. Christel vander Boom‏ : I use Flipboard for http://internationalsafezone.org . Result: workshops in US, Canada, Korea & meeting leaders from all over the world. Q10: How are you currently using smart magazines? Flipboard: If you make a tech #SmartMagazine, you’ll also get an email from @Twittner every Saturday morning. Janette Speyer: Research, finding influencers, curating, reading good stories and information. Bia Valle: I Use smart mags for business subjects I have to stay on top of because of work. Ex: Social Media, Digital + Marketing. Terry Porter‏: I use smart magazines as feeds to read from, but also as sources for flipping to my magazines. Jessica Jordan: I love these #FlipBlogger tips for how to customize Smart Magazines for blogging professionals. Martin Pronk: To be informed about specific topics by a curated group of twitter accounts. A starting point for a magazine to embed. #FlipBizChat takes place every other Thursday at 1 pm Pacific and 4 pm Eastern. Our next Twitter Chat will be about using Flipboard for Multimedia Creator on October 10th. See you there! Thanks for sharing this blog. As a professional content writer its really helpful for me.